Post 102. Meanwhile in a remote village..
We kept Mike and Rob busy for the week. There were lots of people wanting to know all kinds of things. The Woodstock students would get around Rob and throw lots of questions at him. Mike encouraged us with his words of wisdom. It was an amazing time. Chandra was also busy. The most important thing for him was to share his new life with his friends. He loved his labouring job because he loved the men he was working with. A young man, Nandilal, was one of them. He was Nepalese but had never lived in Nepal. He was born in a small village in Himachal Pradesh, near the town of Solan. Nandilal was the first of six children. Scattered in between the surviving siblings were 5 miscarriages. Their house was small and the walk to anywhere was kilometres away. There was no electricity and the toilet was as far as the eye could see; anywhere you couldn’t be seen. Even if you were, it was part of life. No big deal. A landlord owned the house they lived in. They worked his land and paid for their rent that way. They mainly grew tomatoes. The amount of cash they were given was minimal but they were grateful for the roof above their heads. It wasn’t long before Nandilal came with Chandra to meet us. He had already put his faith in Jesus and wanted to meet Chandra’s new family. He was a simple, lovely man with a big smile. He had been talking with Chandra about his family in the village. They had never heard about Jesus. Chandra didn’t hesitate. Within a few weeks they were making their way to Himachal. Chandra was introduced to Nandilal’s younger siblings, Ravinder, Amar, Bhagat, Raju and his beautiful sister, Champa. They all sat for hours talking about Jesus and what he had done in their lives. There were lots of questions and plenty of debate about this new “God” they had never heard of. By the time Chandra got back to Mussoorie, he was in love. He couldn’t stop talking about Nandilal’s beautiful sister, Champa. The only problem was that she was the one who argued the most about Jesus. She didn’t believe what she was hearing. We encouraged him to write to her and to see what happened. A few months later they went on another trip. Chandra let her know how he felt, but told her it wouldn’t work if she weren’t a believer. She didn’t find him at all attractive and made fun of him with her family. There was a lot more discussion and some family members put their faith in Jesus. Soon after that trip, Chandra got the letter he had been waiting for. It was from Champa. “Now that I know the love of Jesus, I know I can also love you.” With that was an invitation to talk to her parents. Chandra didn’t waste any time. 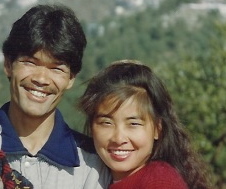 Before we knew it they were engaged and we were planning their wedding in Mussoorie.